Glowing brightly. Take to a revival platform to convert creature essence into a new body. The Creature Implant is an item in ARK: Survival Evolved Mobile. The Creature Implant can be used to resurrect a recently deceased creature. On The Island, it is used to Resurrect recently deceased creatures at an Obelisk or a Revival Platform with Ancient Amber. It is obtained from a creature's inventory. You can obtain this artifact from any creature, even from creatures you hatched. 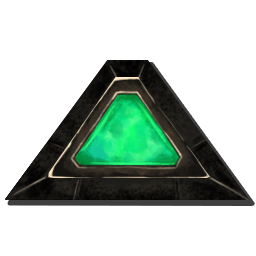 To resurrect a creature, you need to go to an Obelisk beneath an obelisk, place the implant in the Obelisk's Inventory and click “resurrect”. Make sure you have gathered enough Ancient Amber for resurrection. It is highly recommended to put your creatures’ implants in a separate storage box in case you are unable recover it(e.g. item cache decomposed). For wild creatures, you can only obtain it before their corpse disappears by accessing its inventory. If you do not open its inventory before the disappearance of the corpse, the Item Cache (bag) dropped by this creature will not contain its implant. It glows faintly when the host is alive, glows brightly when its host is deceased. Upon the death of its host, a time counter will appear beneath its description. It will not spoil but will expire when the time counter reaches 0. If you lost the implant, it can be recovered by requesting an implant in the hosts' stat tab, however, If its host is killed after you lost the implant, you will not be able to resurrect its host. It will take 24 hours in official and unofficial server, but will be instant in single player. This is the only way to "tame" the upcoming Eerie Creatures as they can't be tamed by any means.